Home Brands Burr Coffee Grinder: Are They Really the Best of the Best? Where to buy a Burr Coffee Grinder? How much does a Burr Coffee Grinder usually cost? Could a Burr Coffee Grinder Change Your Mornings? For some coffee enthusiasts, nothing can start the day off better than a cup of coffee using fresh ground beans straight from your burr coffee grinder. After all, is there any aroma better than that of freshly ground, freshly brewed coffee? Coffee professionals and enthusiasts alike agree that fresh ground coffee just tastes better. Furthermore, there is also a consensus that coffee made with a burr coffee grinder is superior to other grinding methods. Why? Let’s find out. Before you buy a burr coffee grinder, it is worth it to take a look at what makes a burr coffee grinder different and why you should consider owning one in the first place. Though preground coffee is ubiquitous, there are plenty of good reasons to grind your coffee. According to coffee website Coffee Confidential, there are several reasons not to buy coffee pre-ground. Pre-ground coffee easily absorbs odors that are around it, which may not translate into a good coffee drinking experience. Additionally, pre-ground coffee is susceptible to moisture in the air, which can prematurely dilute the coffee oils that make your morning cup of joe so flavorful. The coffee roasting process creates a lot of carbon dioxide inside the bean, which helps to infuse the coffee oils into your water when you make coffee. However, most of the gas contained in the beans are released into the air only a minute after grinding. If you are brewing pre-ground coffee beans, it will be less flavorful. Additionally, oxygen is the enemy of coffee. This is why bags or cans of coffee come packaged in vacuum sealed jars or bags. However, as soon as you open that bag or can, you introduce air into the package. While whole coffee beans will still have a protective outer shell that can help to protect the coffee oils inside the bean, pre-ground coffee beans no longer have that protection. Once you have decided to try grinding your coffee at home, it is good to understand the differences between different coffee grinders. There are a variety of coffee grinders available on the market today. There are two main types of mechanisms you can use to grind coffee. You can use a blade-based grinder or a burr-based grinder. Blade-based grinders chop up the coffee beans using two or more blades. While cheap and efficient, coffee fanatics often regard blade grinders as inferior. This is because the way the blades work, some beans get thrown to the side and be chopped less, while beans closer to the blades will be chopped more. This results in some beans being ground very fine while others ground very coarse. This uneven grind produces a less consistent, less flavorful brew. Burr coffee grinders work by grinding the coffee beans between two burrs, or plates with sharp edges. The grinding action by the burrs makes for a more consistent grind size. A burr coffee grinder has the inherent superiority of producing more consistent grind size, which results in a more consistently replicated brew strength in your cup of coffee. Furthermore, it is easier to control the size of grind with a burr coffee grinder. Burr coffee grinders tend to be more expensive when compared to a blade coffee grinder because burr coffee grinders have more parts. Also, depending on the construction, burr coffee grinders can be difficult to clean. The burrs in burr coffee grinders vary in shape and material. Conical burr grinders use gravity to help move coffee beans downward, feeding them between two rotating burrs. As the coffee beans move downward, they are gradually ground finer between the rotating burrs before exiting the machine. Flat disc burr grinders use mechanical arms that push the beans towards the edge, where they are ground between the burrs. You will find both ceramic and stainless steel burrs in burr coffee grinders. According to Seattle Coffee Gear, for home use, either material works fine. Ceramic burrs are sharper than steel, will stay sharper for longer, and do not heat up as quickly as steel. However, ceramic is more delicate and can break. Steel is softer and heats up more quickly. Steel is also a lot more affordable than ceramic and is less likely to break. Burr coffee grinders are available in electric or manual. Electric grinders allow you to brew with the touch of a button while manual grinders require you to crank a handle to grind your coffee. Manual grinders can come in various sizes from handheld models to larger machines that sit on your counter. Burr coffee grinders are relatively easy to find. You can find them at various big box stores, specialty coffee shops, as well as from a variety of online retailers. Burr coffee grinders are available at all price points. A simple, manual burr grinder can run around $20 while a fancier, electric burr coffee grinder with a large capacity can cost more than $200. We chose a selection of top-rated burr grinders that are available online, finding great choices at all different price points. We also took a look to see what professionals had to say about each one and also what amateur coffee enthusiasts had to say. Here are our top picks, presented in no particular order. The Baratza Virtuoso is a sleek, European-made electric burr coffee grinder. It utilizes 40-millimeter conical steel burrs to grind your coffee to perfection. Its bean hopper can hold eight ounces of coffee beans, while its ground coffee hopper can hold five ounces of fresh ground coffee. The Barataza Virtuoso is quite pricey, you can find it on Amazon, as well as specialty coffee retailers Coffee Bean Corral and Whole Latte Love. Amazon customers gave this burr coffee grinder a 4 out of 5-star rating with 480 reviews. Though 59 percent of the reviews gave it five stars for overall quality, the most helpful critical review noted that his Baratza Virtuoso died twice in 22 months. The Bodum Bistro is an electric burr coffee grinder with steel conical burrs that do not require sharpening. It features a push button design with a pre-set timer and an adjustable grind feature. The bean hopper can hold up to 11 ounces of coffee beans while the ground catcher is made of borosilicate glass, which helps to reduce static. You can find it at online retailers including Amazon, Bed Bath and Beyond, Crate and Barrel, and Kohls. Coffee website My Perfect Grind liked this grinder, finding it to be a good value for the price. One plus that it noted is that the bean catcher is larger than similar coffee grinders on the market. The website also praised the glass ground catcher as it makes for easier cleanup. Tech Gear Lab also gave this grinder a positive review, finding it to be a good budget burr grinder. The Tech Gear Lab review especially recommends this burr grinder for French Press coffee in particular. Amazon customers liked this grinder, with 52 percent of reviewers giving it a 5 out of 5 stars review. Fans of the Bodum Bistro loved having good, fresh-ground coffee at an affordable price point. However, critical reviews complain that the grinder does not last as long as they would have liked. The Hario Skerton Coffee Grinder is a little grinder with a lot of fanfare. 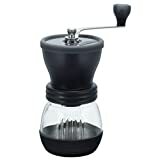 This handheld burr coffee grinder has ceramic burrs, with steel, glass, plastic and silicone parts. The ​​grinder itself holds 3.5 ounces of coffee beans. It can produce any type of grind, from super coarse for a cold brew to super fine for Turkish-style coffee. You can find the Hario Skerton Coffee grinder online at Amazon, Prima Coffee, World Market, and Crate and Barrel. This little handheld grinder is much loved in the coffee world. Home Grounds gives it a 4.3 out of 5-star rating, noting its high-quality construction at an affordable price. The website lauds the Hario Skerton’s ability to produce coarse and fine grinds, something not easily accomplished. However, they also do note that the grind tends to be more consistent at the finer settings. 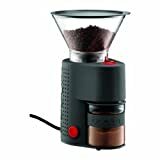 Customers of Prima Coffee praise this coffee maker, calling it a “great, affordable burr grinder.” Some Prima Coffee customers do note that it is quite a workout and that it takes some experimentation to get the correct grind. The Capresso Infinity Conical Burr grinder with commercial-grade, conical steel burrs. The upper burr is removable for easy cleaning. It offers a total of 16 fineness settings, from coarse to superfine. Its top bean container holds up to 8.8 ounces of whole beans while the ground container can hold up to 5 ounces of ground coffee. This grinder is available online from Amazon, Seattle Coffee Gear, Sur La Table, and Crate and Barrel. Seattle Coffee Gear gives this grinder a favorable review, finding it to be a great entry-level machine for the coffee enthusiast who is just getting started on grinding their beans. The reviewer found the grind to be great for pour-over and French press coffee brewing, however, was unhappy with the fineness for espresso. Know Your Grinder, a coffee grinder specialty website, took note of the commercial-grade claims and gave the grinder to a coffee shop owner to use at the shop. Surprisingly, the cafe manager reported that the Capresso Infinity was able to keep up with what they needed, to an extent. The Capresso gets good reviews on Amazon as well, earning 4 out of 5-stars with 4,869 reviews. Positive reviews are impressed with the overall quality of the Capresso Infinity. One reviewer reported that even after three years of home use, the machine was still going strong. However, critical reviews report that the machine is messy. One customer even stated that their machine's grinder trapped up to three grams of powdered grounds inside and was not easy to clean. Other critical reviews echo that sometimes finely ground powder will clog the machine. A burr coffee grinder can make a huge difference in the quality of your morning cup. If you are looking for a good, budget manual grinder, the Hario Skerton is a good option. However, if you have the budget, the Baratza Virtuoso is definitely worth the investment for any coffee lover. Next articleIs This Braun Coffee Grinder the Key to the Ultimate Cup?